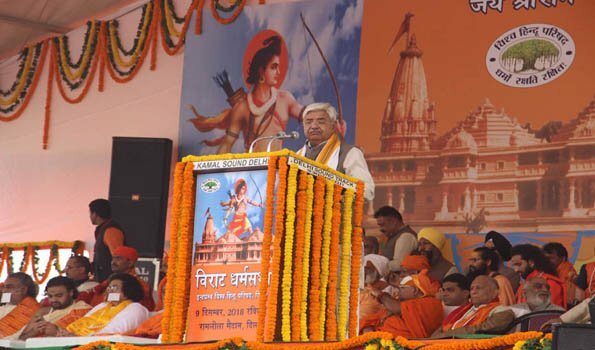 New Delhi: Taking a dig at the ruling dispensation, senior Rashtriya Swayamsevak Sangh (RSS) leader Suresh ‘Bhaiyyaji’ Joshi said on Sunday the Union government has not fulfilled its promise of Ram temple and if required, they should enact a legislation for the same. ‘Those in power today had promised to construct Ram temple. They should heed to people’s sentiments and fulfil the demand of temple in Ayodhya,’ said the septuagenarian leader while addressing at Vishwa Hindu Parishad’s rally at Ramlila Maidan here. The Dharma Sansad is being organised by the Vishwa Hindu Parishad (VHP) and has the backing of Sanghparivar fountainhead. BJP lawmakers from Delhi - Mahesh Giri and Ramesh Bidhuri - are also attending the meet. “The gathering today reflects people’s anguish. Hindus had rested faith in the court but now the judiciary seems to say Ayodhya land dispute is not a priority case. It is the same judiciary which has worked past mid night for a convicted terrorist. So Hindu anguish is being reflected in the streets of Delhi,” East Delhi MP Giri said. Vocal lawmaker Bidhuri said: “We are expecting a gathering of five lakh people. Ram Bhakts want a grand Temple for Bhagwan Ram and we want it at the earliest....Why further delay”. “The rally will pressurise all political parties to pass a Bill for the construction of a Ram temple by Parliament during winter session,” VHP Joint Secretary Surendra Jain said here on Saturday. The VHP-RSS mega show in the capital comes just days before the winter session of Parliament begins. What is being regarded as the last full-fledged Parliament session under Narendra Modi-led dispensation, the proceedings of both the Houses would commence on December 11. No clear indications have been given yet on how the ruling party proposes to deal with the much talked about Ram Temple issue at Ayodhya on the floor of both the Houses of Parliament. BJP chief Amit Shah on Saturday told a function that “a grand Ram temple should be built immediately and without any delay”. He also accused the Congress of trying to create hurdles in the path of temple construction and said there was no basis when Congress leader Kapil Sibal had petitioned the Supreme Court to postpone the hearing of the Ayodhya title suit till the 2019 polls were over. In a press conference, BJP leader Shahnawaj Hussain said,’ There is ‘jan bhavna’ (sentiments of the people) that temple should be built so there should not be delay in this work.